HFLINK.COM is an international resource for radio operators using ALE Automatic Link Establishment and SELCALL Selective Calling. "What is that strange turkey gobbling sound I just heard on 20 meters?" Oh, just a bunch of hams with a taste for ALE! ALE is the humorous acronym for the lofty-sounding Automatic Link Establishment. With the capability to call up a specific station, a group of stations, a net... or just CQ, ALE is a versatile system for connecting operators for voice, data, text, instant messaging, or image QSOs. A radio operator initiating a call, can within minutes have the ALE automatically pick the best clear frequency. It signals the operators on both ends, so they can begin communicating with each other immediately. In this respect, it can eliminate the longstanding need for repetitive calling on pre-determined time schedules and monitoring static on HF. It is a great tool for finding a clear frequency between stations in real-time, while avoiding guesswork, beacon listening, and complicated HF prediction charts altogether. These days, ALE is most commonly used for hooking up operators for voice QSOs on SSB, but there are many other useful features. For the past 7 years, a group of Amateur Radio operators has joined together for experiments and communications using ALE and Selective Calling. The number of hams has grown from just a handful active in 2001, to the hundreds of enthusiasts in it today. Some are following the traditional ham curiosity to explore interesting aspects of communications; others are developing dependable HF nets, or just using it to keep in touch with a circle of ham friends. The need to call up emergency nets or inter-operability and liason with government HF systems has led many hams to adopt the government ALE standard, called FED-STD-1045 or MIL-STD 188-141. This standard caught on slowly in the ham community, initiated by a few operators with limited government surplus gear and some with expensive commercial equipment having embedded ALE or hardware controllers. Now, with a ham HF transceiver, a computer as the controller, and an appropriate antenna system, hams can harness the power of ALE. Each ham radio ALE station uses the operator's callsign as an address in the ALE controller.When not actively in a QSO with another station, each HF SSB transceiver constantly scans through a list of frequencies, listening for its callsign. To reach a specific station, the caller simply enters the callsign just like dialing a phone number. The ALE controller selects the best available frequency and sends out brief selective calling signals containing the callsigns. When the distant scanning station detects the first few characters of its callsign, it stops scanning and stays on that frequency. The two stations' ALE controllers automatically handshake to confirm that a link is established and they are ready to communicate. The receiving station, which was muted up until now, will typically emit an audible alarm and visual alert for the receiving operator of the incoming call. It also indicates the callsign of the linked station. The operators then can talk in a regular QSO. At the conclusion of the QSO, one of the stations sends a disconnect signal to the other station, and they each return their ALE stations to the scanning mode. Some military / commercial HF transceivers are available with ALE options. Amateurs commonly use G4GUO's PCALE soundcard software interfaced to a ham transceiver via RS-232 CAT port, multi-frequency antenna. In 2001, Charles Brain G4GUO, wrote and released a soundcard PC program for ALE appropriately named PCALE. Charles is to be commended for his wonderful generosity and technical achievement. By doing this, he effectively opened up ALE to the non-professional user at low cost. The availability of PCALE in various improving versions made it possible for more amateur radio operators to start experimenting with ALE. During 2001, several hams in USA started using PCALE, at the suggestion of Trish WA6UBE. Trish's already-operational Motorola Micom 2R transceiver (with embedded ALE) became one of the center points for testing and linking. In December 2001, from this core of early ALE operators, an egroup called HFLINK was founded by the author. The purpose of HFLINK would be to further the development of methods and coordination for use of ALE and Selective Calling in HF Amateur Radio. The HFLINK egroup helped work out guidelines for use of ALE under current FCC rules. The scanning frequencies essential for effective ALE operation evolved and became HFLINK channel lists. USA hams can legally use ALE's Selective Calling and Alerting features in the phone subbands, and all of the features of ALE in the data subbands. One of the aspects of operation using "new technology" in Amateur Radio is navigating the complexities of arcane, and sometimes contradictory FCC rules regarding modes, bauds, and subbands. Currently, many countries of the world have reasonable, easily understood bandwidth-based Amateur Radio rules where most of the protocol and features of ALE can be utilized freely. The USA Amateur Radio Service has been somewhat hamstrung in this respect, due to our more antiquated mode-based rules. There are several rule-changing proposals in progress which seek to take the USA Amateur Radio Service from its present mode-based rules to the more modern bandwidth-based rules. So, US operators might someday in the future, enjoy the freedom that other hams of the world already have to explore communications technology. Currently, USA Amateur Radio Service operators are legally utilizing ALE and SELCAL in the "phone bands". Transmissions fall under the FCC rule's statement: "Incidental tones for the purpose of selective calling or alerting or to control the level of a demodulated signal may also be considered phone." ALE controller units use handshake signals to set up communication links between stations... The 1st station initiates the calling, the 2nd station ACKs (acknowledges) the reception of the call, and the 1st station ACKs the 2nd station's ACK... in other words, it is a 3-way exchange of signalling to set up the communication to be in a linked status. Within this 3-way linking signal exchange, there are parts of the ALE protocol that can include "incidental" types of very limited text/status sequences and Link Quality signals, AMDs, or MOTDs. "Where do we draw the line between Automatic Link Establishment operation as a PHONE mode, and make the conceptual jump to DATA mode under the FCC rules?" The complex language of FCC rules are attempts at drawing clear lines between what is allowed and not allowed, but technology often turns these clear lines fuzzy. If the "spirit of the rules" are to be our guide, once the selective call or ALE exchange happens, and the LINKED status is established, the use of the ALE or selcall modem should cease and voice should commence. 4. Selective calling signals to set up a voice or image contact for QSO with other station(s). 5. Alerting another station to talk on voice. 6. Alerting another station to QSY. 7. Sending an alerting or selective calling signal to break the link. Perhaps the ALE protocol and features themselves provide an easy way for us as operators to make the fuzzy line between PHONE and DATA a little clearer! In the ALE protocol, there is a point during the "handshake" between two stations when the ALE software or the ALE controller tells the user that the station is LINKED. It means that you have succeeded with Selective Calling of the other station(s). We can use this LINKED status indicator as a dividing line between what the FCC defines as PHONE and DATA operation. If we use the AMD or data modem after the indicator says we are LINKED, we are probably stepping out of the PHONE mode and into DATA mode. 1. An AMD to alert the other station to QSY or start scanning for a selective call on another channel. 2. An AMD or CALL to attempt to call yet another station. 3. An AMD to alert another station to talk on voice. 4. The limited orderwire that gets a free ride as part of the selective calling and alerting signalling. 5. Some bands such as 160 meters which do not have phone subbands. Here are some excerpts of present Amateur Radio Service FCC rules permitting the use of ALE and SELCALL for Selective Calling and Alerting in the PHONE sub-bands. Please note the last sentence in §97.3(c)(5) which is the definition of Phone mode. At the bottom are the URLs for §2.201 of FCC Rules which define emission type designators. modulation and transmission characteristics, for information on emission type designators. ....[extraneous text deleted](5) Phone. Speech and other sound emissions havingdesignators with A, C, D, F, G, H, J or R as the firstsymbol; 1, 2 or 3 as the second symbol; E as the thirdsymbol. Also speech emissions having B as the first symbol; 7, 8 or 9 as the second symbol; E as the third symbol. MCW for the purpose of performing the station identification procedure, or for providing telegraphy practice interspersed with speech. Incidental tones for the purpose of selective calling or alerting or to control the level of a demodulated signal may also be considered phone." 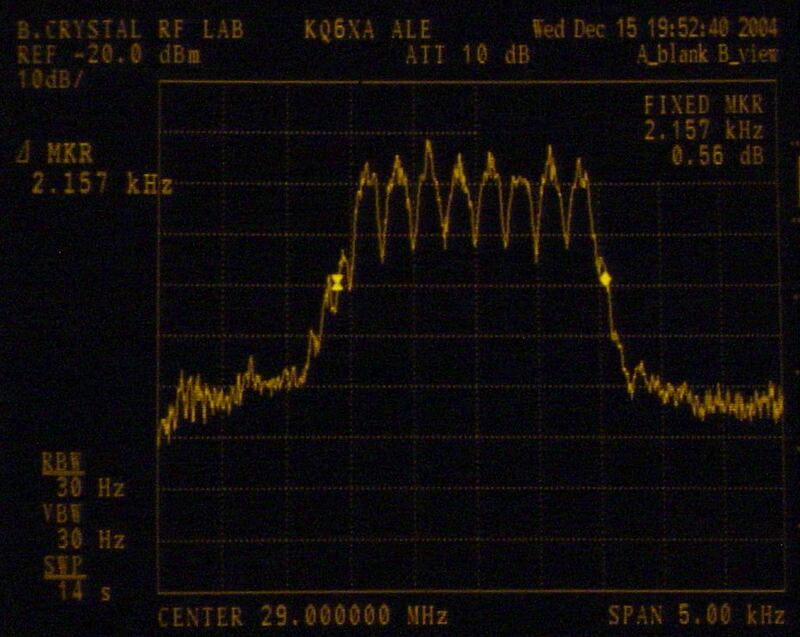 Does the ALE RF Signal Meet the FCC "300 Baud Rule" for Data mode? signal makes per second. The ALE signal is 8FSK (8 Frequency Shift Keyed). 8 discrete tone frequencies are spaced 250 Hz apart from 750 Hz to 2500 Hz at audio baseband. Each symbol represents three bits of data, resulting in an over-the-air data rate of 375 bits per second (b/s) using 125 baud. What is the Bandwidth of the ALE Signal? Does it meet FCC specifications? The FCC does not currently specify an occupied bandwidth limitation for DATA emission, other than the stipulation that bandwidths must not be excessive for the data rate used. The ALE modem using MIL-STD 188-141B or FED-STD-1045 does not use excessive bandwidth to obtain sufficient signal quality error rates to establish linking through difficult HF noise conditions. The bandwidth is similar to PACTOR-III which is in current use in the Amateur Service. The ALE signal bandwidth is suitable for transmission via HF transceivers through a standard SSB audio/RF chain with an IF bandwidth of about 2.5 kHz. The 8aryFSK tones take up about 1750 Hz, but when they are keyed rapidly, the bandwidth spreads out. In practice, for demodulating, amateurs have been able to use receive IF filters as narrow as about 2200 Hz. The signal is somewhat resistant to noise, QRM, passband tilt, group delay, and phase distortion. It can be run through typical SSB transceivers with speech compressors on transmit and various AGC characteristics on receive. However, DSP Noise Reduction receive circuits tend to be counterproductive. What subbands should be used with the ALE modem for DATA mode? Current FCC Rules specify that the data signal may be transmitted anywhere in the allocated DATA mode sub-bands. group has recently adopted channel frequencies within the PACTOR sub-bands. HFLINK's current channel list includes these "DATA" channels. For operation as an ALE system, the HF communications system normally has a number of channels assigned to it throughout the HF spectrum. The system works much like a telephone in that each radio in a network is assigned an address (ID). When not in use, each radio receiver constantly scans through its assigned frequencies (channels), listening for calls addressed to it. To reach a specific station, the caller simply enters an ID just like dialing a phone number. It takes a lot of time for the radio to go through the sequence of calling a station on every one of the assigned channels. But there are several ways the ALE system can be programmed to decrease the time it takes, over simple random scanning and sequential channel calling. 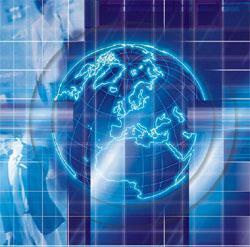 Methods for decreasing the time by using a "smarter" way of predictive or synchronized linking can be applied. An ALE system utilizing (Link Quality Analysis) capability uses periodic sounding and linking signals between other stations in the network, to predict which channel is clear to call on at any given time. When a call is initiated to a station, the radio automatically checks its LQA matrix “memory” to make a determination of the most probable best quality channel for the call to the desired station, based upon its record of recent Link Quality data it has logged on that station. It then makes its first attempted linking call on that most probable channel. If the link cannot be established, it will try again on the next best frequency in the matrix, and so on, until a link is established. Since HF clear frequencies can change very quickly, typical ALE systems using LQA make use of recently measured soundings within the past few hours. Audio path: Soundcard to Rigblaster to mic input. It is easy to see the sharp spikes at the centers of a few of the tone carriers (above). Upon close inspection of the audio waveform (below) using 16bit sampled audio, and looking at the excerpt of the specification (below) for the ALE system, notice that the 8-ary FSK tone frequencies are shifted at the peaks of the sinewaves. Perhaps this is the cause of the spectrum spikes. In any case, this spectrum analysis shows that a properly adjusted amateur transceiver running soundcard- generated ALE signals can transmit a clean signal and easily operate within an occupied bandwidth of less than 2.5kHz, similar to a voice transmission. The ALE waveform is designed to pass through the audio passband of standard SSB radio equipment. This waveform shall provide for a robust, low-speed, digital modem capability used for multiple purposes to include selective calling and data transmission. This section defines the waveform including the tones, their meanings, the timing and rates, and their accuracy. The transmitted bits shall be encoded and interleaved data bits constituting a word, as described in paragraphs A.5.2.2 and A.5.2.3. The transitions between tones shall be phase continuous and shall be at waveform maxima or minima (slope zero). 49 symbols (or tones) per redundant (tripled) word. The resultant single word period (Tw) shall be 130.66... ms (or 16.33... symbols), and the triple word (basic redundant format) period (3 Tw) shall be 392 ms.
At baseband audio, the generated tones shall be within +1.0 Hz. At rf, all transmitted tones shall be within the range of 2.0 dB in amplitude. 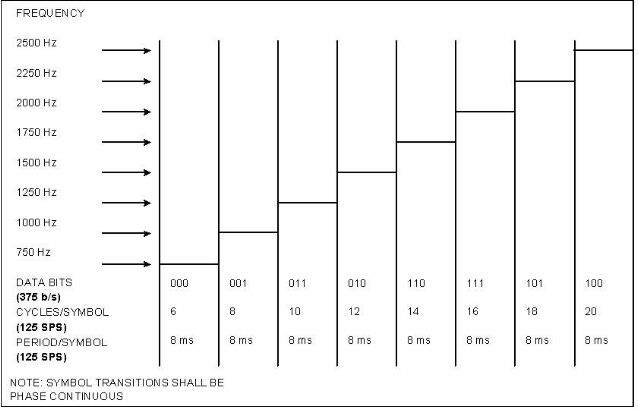 Transmitted symbol timing, and therefore, the bit and word rates shall be within ten parts per million. figure A-5 - ALE Timing and Coding. The fine print: ©2001, 2002, 2003, 2004, 2005, 2006 HFpack, Inc. All Rights Reserved. HFLINK, HF-LINK, HF LINK, and the HFLINK Logo are trademarks of HFLINK, owned by HFpack, Inc. The HFLINK Logo may be used by non-commercial or commercial websites only for the purpose of hyperlinking to the main page of the HFLINK.COM website http://hflink.com . Capture of the HFLINK website or any part of it within the frame of another website is not permitted. Public archiving, forwarding, or open display on the internet of the HFLINK egroup group forum is forbidden. All photos on the HFLINK website are property or copyrighted by HFpack, Inc. or when used by permission, are copyright by their respective owners, with all rights reserved. No part of the HFLINK website or HFLINK Group Forum may be used or copied without written permission. digital selective calling system automatic link establishment . HFLINK - Communications Equipment - HF VHF UHF Antennas FH ALE Manpack Milisec Broadband Dipole Portable Base Mobile Voice HF SSB FM Data Automatic Link Establishment Selective Calling Broadband Antenna. HFLINK is at the forefront of military, government, commercial, and other HF - VHF and UHF radio systems that are highly flexible, interoperable, and capable of simultaneously supporting diverse mission requirements, special operations, emergency communications systems, homeland security, HF SSB, VHF FM, FH frequency hopping radios, ALE Automatic Link Establishment Systems, broadband and wideband communications. ©Copyright 2003 HFLINK. HFLINK, the HFLINK Logo, and other HFLINK trade dress are trademarks of HFLINK. The overall respective look, feel, and trade dress of these entities are trademarks and intellectual property of HFLINK. The HFLINK Logo may be used by non-commercial or commercial websites only for the purpose of including an http hyperlink to the main web index page of the HFLINK.com website. Capture of the HFLINK website or any part of it within the frame of another website is not authorized and not permitted. All photos, reproductions, screen captures, or use of images on the HFLINK website are strictly forbidden except when used by written permission. All links to the HFLINK web site must be to the main index page http://www.HFLINK.com. All copyrights and trademarks used on this page are trademarks and copyrights of their respective owners. Millisec, milspec, millspeck, millspec, millsec, millisec, milispec, milisec, and milsec. folded dipole, T2FD, TFD, terminated folded dipole, tilted terminated folded dipole, terminated dipole antenna, broadband terminated dipole antenna, broadband terminated antenna, broadband vertical antenna, broadband terminated vertical antenna, wideband antenna, broadband portable antenna, broadband HF antenna, HF SSB antenna, marine HF SSB antenna, marine antenna, sailboat antenna, HF SSB antenna, HF broadband folded dipole antennas for conventional, NVIS, and ALE use, ALE antenna, FH antenna, AC-1.8-30, ACS-1.8-30, Frequency Hopping antenna, frequency agile antenna, Amateurs. ©Copyright 2003 HFLINK. HFLINK, the HFLINK Logo, and other HFLINK trade dress are trademarks of HFLINK. The overall respective look, feel, and trade dress of these entities are trademarks and intellectual property of HFLINK. The HFLINK Logo may be used by non-commercial or commercial websites only for the purpose of including an http hyperlink to the main web index page of the HFLINK.com website. Capture of the HFLINK website or any part of it within the frame of another website is not authorized and not permitted. All photos, reproductions, screen captures, or use of images on the HFLINK website are strictly forbidden except when used by written permission. All links to the HFLINK web site must be to the main index page http://www.HFLINK.com. All copyrights and trademarks used on this page are trademarks and copyrights of their respective owners. vertex, yaesu, QMAC, HF-90, australian, codan, barrett, selcall compatible, resistively matched antenna, resistive matched resistive match RT-1694(P) resistance match antenna, motorola, resistive terminated antenna, resistor terminated antenna, travelling wave antenna, HFLINK, clansman broadband dipole, NVIS loop antenna, small loop antenna, milisec broadband antennas,mobile NVIS loop antenna, valcom, PRC-150 antenna, prc150 antenna, prc 150 antenna, broadband dipole, ale dipole, RF-5800, hf modem, solar cell, solar panel, solar charger, solar battery, mobat, telecom, portable solar panel, LRRP antenna, long range radio patrol, long range recon patrol, antenna, collapsible whip antenna, tadiran, dielectric. This site gives possible references to the following terms which may be useful to those who are searching: ©Copyright 2003 HFLINK. HFLINK, the HFLINK Logo, and other HFLINK trade dress are trademarks of HFLINK. The overall respective look, feel, and trade dress of these entities are trademarks and intellectual property of HFLINK. The HFLINK Logo may be used by non-commercial or commercial websites only for the purpose of including an http hyperlink to the main web index page of the HFLINK.com website. Capture of the HFLINK website or any part of it within the frame of another website is not authorized and not permitted. All photos, reproductions, screen captures, or use of images on the HFLINK website are strictly forbidden except when used by written permission. All links to the HFLINK web site must be to the main index page http://www.HFLINK.com. All copyrights and trademarks used on this page are trademarks and copyrights of their respective owners. HFlink logo is a trademark of HFpack, Inc. This website and all content: copyright (c) 2006 HFpack, Inc.